Combine flour, baking powder, salt, and baking soda in a bowl; cut in shortening until mixture is crumbly. Add milk and sour cream until dough comes together. Turn dough onto a floured work surface; knead 10 times. Roll out dough and cut into biscuits. Place biscuits on a baking sheet. Bake in the preheated oven until biscuits are lightly browned, about 10 minutes. Turned out very well light and fluffy. I used butter instead of shortening. Plus I added maybe a teaspoon of sugar. I will be making them again. Quick and easy, and came out perfect. 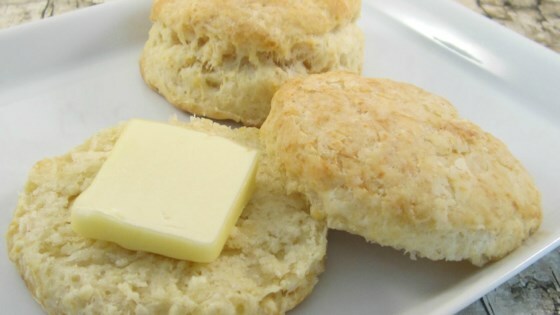 simple and delicious, my new go to biscuit recipe. Very good biscuit recipe. Great way to use up leftover sour cream. I used butter instead of shortening and doubled the recipe. The biscuits came out just fine.